As a member of the National Demolition Association, we specialize in all aspects of demolition including: concrete crushing, recycling, decommissioning, and more. From single unit homes to multiple story buildings, Mark Cerrone Inc. provides demolition services 24 hours a day, seven days a week. Landscaping is the final touch that adds aesthetic appeal and stability to any construction project. Mark Cerrone Inc. can provide the right landscaping solutions to meet your needs. Our crews specialize in both hard and softscapes, adding beauty and durability for years to come. 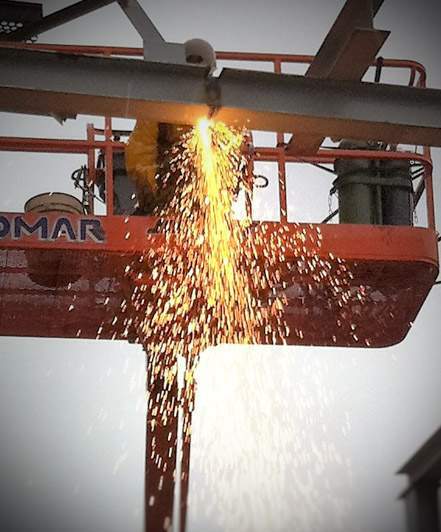 From complete bridge removals to erection and maintenance, Mark Cerrone Inc. performs bridge construction and maintenance work as well as all associated site and abutment work. Our firm is able to provide specifically focused construction services on bridge projects of varying scopes, sizes, & scale. Mark Cerrone Inc.’s paving construction division provides clients with the best possible paving solutions for their construction projects. Our road work renovations give our cities and towns functionality, curb appeal, and durability. We specialize in both asphalt and concrete applications, meeting your requirements. At Mark Cerrone Inc., our Asbestos Abatement team has over 50 years of combined experience. We service both small and large scale projects and can provide you with cost effective environmental solutions for all of your abatement needs. We have the qualifications to efficiently and safely install your site utilities. Standard installations to 30 ft. depths, we have the ability to complete site utility work of any size or scope. Services include domestic water, sanitary and storm sewers, drainage structures, and more. Mark Cerrone Inc. excels in all aspects of site preparation. We specialize in both small and large scale site development performing our work in a safe and timely manner so your project can be completed on time and within budget. Mark Cerrone Inc. provides concrete solutions for every phase of your project. From foundations, sidewalks, pads, and patios to colored and stamped installations, we service both public and industrial clients. Click below to learn more. Mark Cerrone Inc. can quickly, efficiently, and safely handle all of your environmental remediation needs. We have the diversification of skills as well as the credentials to execute a wide variety of environmental tasks—making us the right choice for your remediation projects. Backed by our experience in landfill construction and an excellent safety record, we can build your next landfill project. Our fleet of off-road trucks, dump trucks, and GPS equipped heavy equipment allows us to quickly, and accurately handle major landfill projects. Mark Cerrone Inc. provides sports field construction solutions for parks, local schools, universities, and sports stadiums. We construct natural and artificial turf surfaces creating sustainability while adding value to your project. Streetscape helps communities improve the safety & economic vitality of their surrounding areas. Our firm works with urban designers, architects & engineers to carry out their vision. We understand needs of business owners during construction activities, helping companies to stay open, accessible & viable. We offer our clients complete construction solutions. Mark Cerrone Inc. can take your project from planning and budgeting through project management and on to completion. We provide the highest caliber of quality construction services, an excellent safety record, and affordable solutions. Since 2003 our track inspection and maintenance programs ensure your railway stays in service, meeting all the of current FRA, CSX, and Amtrak safety and operating standards. From major track installations to emergency repairs and derailment response, we service all of your track needs. Our exemplary safety record and ratings meet the high standards set by major clients, and our management team has an excellent track record in working with plant personnel to coordinate and implement work to maintain production and keep your plant in operation. It's not just the slogan that appears on our letterhead, trucks and equipment. It’s an essential part of our business philosophy. Mark Cerrone, Inc. is committed to providing the safest possible workplace for our employees, subcontractors, clients and the people who live and work in our communities and near our jobsites. Our management team, in cooperation with our employees and subcontractors, strives to create a culture of safety by not only meeting Federal, State and local standards but by exceeding them with company standards. Mark Cerrone Inc.’s Health & Safety program provides essential training to all of our employees at every level and a sense of awareness and a culture of “safety first” in a competitive and challenging industry. As General Contractors, we offer our clients complete construction management solutions. Our services range from project planning, analysis, budgeting to management and implementation. Our team provides the highest caliber of quality construction services, an excellent safety record and affordable solutions to meet all of your construction needs. From demolition through landscaping, Mark Cerrone Inc. is your complete solutions contractor. Learn more about Mark Cerrone, Inc.
As General Contractors, we offer our clients complete construction management solutions. From demolition through landscaping, Mark Cerrone Inc. is your complete solutions contractor.